I experienced the Play! 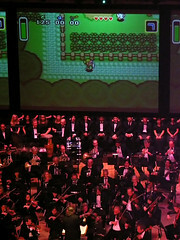 Video Game Symphony yesterday and it was amazingly good! A big multi-disciplinary orchestra and a choir almost as big. Some guy called Akira Yamaoka played electric guitar as a guest appearance, which I didn’t really like. Then some rockers from US or something almost ruined the whole show by flipping out with drums and angry, electric guitars. However, the rest of the show was as I said earlier, amazing. A lot of classics performed with beautiful stroke music, horns, trumpets and you name it. All 1 770 tickets were sold out.